Skip ironing and harsh chemicals with these five simple, natural solutions to eliminate wrinkles from your clothes. Throw the wrinkled clothes back in the dryer and add a wet washcloth to create a steam dryer. Run 5-10 minutes and all of the wrinkles will be gone. Shake and snap your clothes back into shape between washer and dryer. Crumpled clothes from the washer are more likely to stay crumpled and a bit wrinkled in the dryer. Adjust your dryer settings to lower temperatures and slower speeds to reduce wrinkles, and it is less wear & tear on your clothes extending their color and shape. Remove clothes promptly from the dryer. Consider pulling clothes out of the dryer a couple minutes before the cycle shuts off. 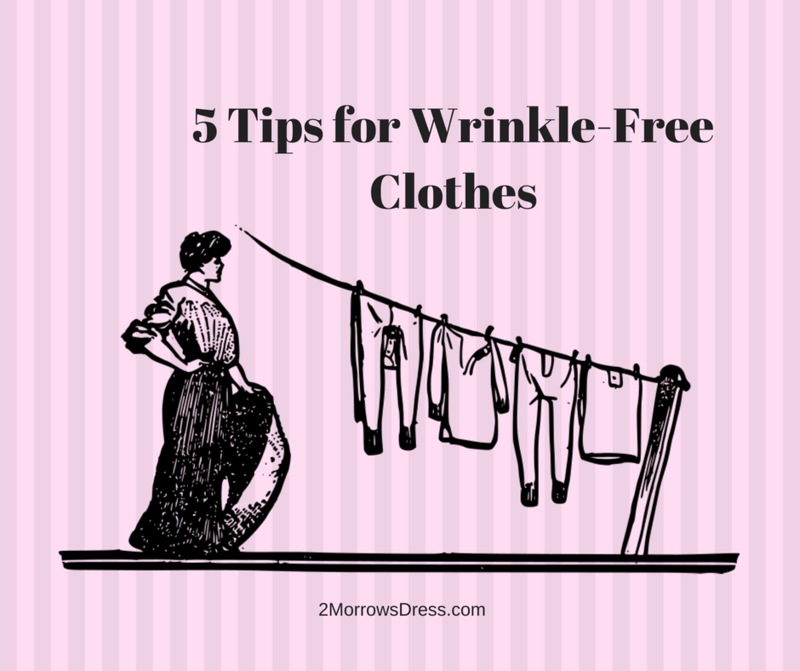 Clothes hung when slightly damp will naturally be less wrinkled due to the weight of the fabric providing a little pull on any remaining wrinkles. Let gravity fight the wrinkles and save dryer time in the process. Spritz with a little water instead of ironing. Cotton, linen, and other natural fibers respond well to a lite misting of water, shake & snap, then hang to dry for a low energy wrinkle release. You do not need fancy “wrinkle release” sprays, a little distilled or filtered water is just as effective without the added chemicals and fragrances. What are your non-toxic, chemical-free options to naturally remove wrinkles from clothes? Share your wrinkle fighting tips and tricks in the comments below. In reference to no. 4, I use this tip with my washer; —have lived on the desert for 47 years without a dryer and when washer reaches that point during final spin when clothing no longer drips, I remove it and hang to dry. Gravity does its thing, “ironing” clothing dry in no time given desert’s dry air. Very true! Most clothes can be hung to dry, especially in the dry desert. I do prefer towels in the dryer, they tend to be softer from the dryer than the fresh air.